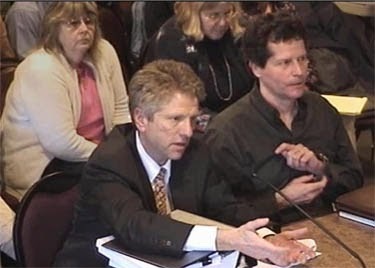 David Dehlendorf and Friends Attorney Kyle Loring raised a stink about the fact that three Common Sense Alliance (CSA) Board members sit on the Planning Commission. Dehlenloring alleged that it was a conflict of interest since CSA is opposing the County's draft of the Critical Areas Ordinance (CAO) in court. Loring even said that the conflict was so obvious that it was "Ethics 101." If it is Ethics 101, then Dehlendorf and Loring are late to class. Unlike the Friends, CSA has never received a penny from the County and never voted to give itself grant funding. Unlike the Friends, CSA is a relative newcomer to County advisory committees. In fact, when Mike Carlson of CSA was appointed to the Planning Commission, he replaced Mike Kaill, former President of the Friends Board. Kaill's tenure on the Planning Commission coincided with the Friends opposition (including lawsuits) of the County's guesthouse legislation. Where were Dehlenloring's concerns about ethics then? Or ... when Susan Dehlendorf took a "straw poll" of Planning Commissioners regarding the CAO last year, where were the concerns about ethics? Ethics 101? It seems more like Ethics-ish 101. When Dehlenloring are interested in ethics for everybody instead of simply using the name of ethics as a tool to advance their own interests, then we're more likely to pay attention. By the way, our Prosecuting Attorney reviewed the issue and twice produced a written opinion saying there is no conflict. The Planning Commission is only an advisory body to the Council, and as such, no conflict exists. By now, most people have probably heard that the Bureau of Land Management (BLM) has been armoring the beach at Watmough Bay, one of the most beloved pocket beaches in all the islands ... and certainly one of the most beloved beaches on Lopez Island. There are several incredible ironies about this story, which we will cover in greater detail in an upcoming post. First, the hard armoring isn't even protecting any structures. Second, despite all the meetings with BLM officials over the past few months about local outreach and involvement, apparently no locals knew the hard armoring project was in the works. Third, the BLM produced an Environmental Assessment of the proposed work which led to a "Finding of No Significant Impact" (FONSI). Think about that for a moment ... the federal government armored a beach in the National Monument and there are no significant impacts, and yet the Friends oppose nearly every dock and armoring project on the grounds that there are environmental impacts. Fourth, one of the contractors involved in the Watmough Bay project, Coastal Geologic Services, is the Friends "go to" consultant whenever the Friends oppose docks and armoring. It's hard to believe the Friends didn't know about the Watmough Bay project ahead of time ... and yet they said nothing, even as they opposed other armoring projects elsewhere and opposed the expansion of the Islander Resort on Fisherman Bay too. There are more ironies, but ... we'll cover them in the upcoming full post. Speaking of the Friends, they're at it again. One of the key strategies of the Friends is to take local issues and link them to national and international affairs, so that we become subsumed into a global matrix of restrictions based on the pretense of "local protection." Case in point was Stephanie Buffum signing a treaty to protect the Salish Sea last March. As we've seen, the Friends' megalomania becomes especially virulent when it comes into contact with grant money. Below is an email from ex-CDPD employee Elizabeth Anderson talking to the usual suspects ... Barbara Rosenkotter and Stephanie Buffum ... about (wait for it) a grant to designate our waters a Particularly Sensitive Sea Area (PSSA). I know ... yet another acronym. It never ends. Some of you may remember Elizabeth Anderson, whose employment with CDPD was justified by (you guessed it) a grant, and who was put in charge of writing a County Solid Waste Management Plan during the collapse of the County's solid waste management system. Her time here could not have been more fruitless and pointless. Now she is touting another "brilliant program." OOPS! I forgot to copy you on this. Stephanie - this is a brilliant program with a high degree of probability of success in preventing oil spills. However, it does not fit the NTA where I had notes that you would provide some further milestones. I attach the revised table thus far. The only red letters are under SD 1B, where I thought you had more to add. It may be fine as-is. Do I need to add anything from yesterday's IC discussion? The purpose of the Particularly Sensitive Sea Area (PSSA) for the Salish Sea Feasibility Study is to investigate the possible benefits and costs of enhancing the management regime of the areas surrounding the shipping lanes surrounding the San Juan Island National Monument, through the creation of an internationally mandated Particularly Sensitive Sea Area for the Salish Sea. This potential designation can only be achieved if the area is particularly sensitive (in ecological and cultural terms) and the existing regulatory regime does not adequately protect it. Whilst such PSSA designations have been recognized in other parts of the United States and the international community, they have not been considered in the context of the highly vulnerable Salish Sea. To communicate to the Salish Sea populace, including organizations, business, Tribes and First Nations and government, what important ecological and cultural values are present in the Salish Sea, their fragility, and how they will be negatively impacted upon if the risk of vessel traffic in this area is not adequately managed, as it is in other part of the United States, and similarly, within the international community. Simply, we wish to show the gaps in our regulatory protection of the Salish Sea, and an existing tool can be applied to fix this problem, to the benefit of both the ecology and the surrounding communities. 1. To provide a principle campaign tool for protecting marine waters. 2. To educate the public about what is at stake if large scale shipping traffic of potentially hazardous cargo, is not adequately regulated. 3. To show how adequate management has been achieved in comparable areas with similar risks to the Salish Sea. 5. To develop “new evidence” to bring to any review process. 6. To provide an Alternative, which has been successfully adopted elsewhere, to reduce the risk of an oil spill in the Salish Sea. The audience is the general population of the Salish Sea. The request for designation will require Washington State Tribes and Canadian First Nations, federal, provincial, state and local leaders and public officials to support this designation. Key business leaders and ngo organizations in British Columbia and the US, principally within Washington State, will be essential for cultivating support for these two proposals separately in the US and in Canada. According to State law, our elected Prosecuting Attorney serves as a legal advisor to our Council while also representing the County in all criminal and civil proceedings where the County is a party. Under our Charter, the Council must use resolutions to declare policy or exercise its executive power. When the County's CAO was appealed to the Growth Management Hearings Board (GMHB) in June 2013, our Prosecuting Attorney's (PA's) Office defended the ordinance in front of the GMHB. I want readers to take particular note of the date. The GMHB hearings occurred during June 2013 ... after our new three-person Council took office. Our PA's defense of the CAO ostensibly took place under the direction of a different Council from the one that rammed the CAOs down our throats in its waning days last December. Our current Council has not passed any resolutions declaring its policy stance towards the new CAO nor directed the PA to defend any particular position regarding the previous Council's CAO work product. Then, when the GMHB ruling came down in September 2013, it was the PA who issued a press release declaring the GMHB outcome to be largely a victory for the County. Again, there was no comment or resolution from the County Council. Even though the GMHB ruling struck down parts of the County's CAO, the County did not file to defend the new CAOs in Superior Court (CSA and the Friends have filed suit with Superior Court). Again, there has been no comment or resolution from the County Council. Last week, the PA's office opposed a Motion to Stay brought by CSA regarding enactment of the new CAO. CSA seeks to stay the implementation of the new CAO until the legal issues can be fully resolved by the courts. Along with the Friends, our PA's office, on behalf of our County, is opposing the motion. Again, there has been no comment or resolution from the County Council. New Council takes over in May 2013. What do we hear from our Council about the CAO? ... crickets. The GMHB hearings occur in June 2013. What do we hear from our Council in terms of coordinating with the PA on a position regarding the CAO? ... crickets. The GMHB ruling is issued in September 2013. What do we hear from our Council? ... crickets. CSA and the Friends file to take the GMHB ruling to Superior Court in October 2013. What do we hear from our Council? ... crickets. Our PA files an opposition to CSA's Motion to Stay in October 2013 ... and so do the Friends. What do we hear from our Council? ... crickets. No one knows how the new CAOs will affect wildlife in the San Juans, but the crickets are flourishing at the County Council chambers. With last week's opposition to stay, this Council cannot hide from the CAOs anymore. We already knew of Stephens' advocacy for the CAOs, since he voted for them. Now, we have to put Hughes' and Jarman's names alongside those of Pratt, Miller, Fralick, and Rosenfeld as those who are forcing a dysfunctional CAO upon us. Not even Pratt, Miller, Fralick, and Rosenfeld took court action to have the CAOs enacted, but last week, this Council allowed our PA to do just that. While our Council does nothing, Gaylord is making up County policy out of thin air ... and our Council sits on its hands doing nothing to stop it. The CAOs have acquired several nicknames over the past few years ... Crazy Asinine Ordinance, Critical Agenda (21) Ordinance, Can't Avoid Obedience ... but under this Council, it might as well stand for "Currently Absent Officials." Despite the fact that the CAOs were a major election issue, this Council has done nothing about them, and in the resulting policy vacuum, our PA has been happy to act in their place. Who is directing our PA regarding the CAOs? Answer: Not our Council. One of the common threads in the environmental-ish world is that rules apply only to the non-environmental-ish segment of society. We've seen this at work with the Friends, who have long criticized guesthouses for everyone else, but seem to like them personally. Former Friends Board member, Vivian Burnet, had an illegal guesthouse. Former Friends President, Lynn Bahrych, who started off the whole guesthouse fiasco by filing a guesthouse lawsuit in 1999, had a guesthouse. Friends attorney, Kyle Loring, has a guesthouse. Former Friends President, George Lawson, has a guesthouse ... and there are probably others. Another common thread in the environmental-ish world is to distort the meaning of "grassroots" and "local." Nowhere is this more apparent than in the oxymoronic title of the organization "ICLEI" ... which stands for the "International Council for Local Environmental Initiatives" with their motto of "Local Action Moves the World." Think about that for a moment ... how can there be an "international" council about "local" initiatives? In the case of ICLEI, the global organization provides a blueprint for local communities to follow ... so that each community fits into ICLEI's overall design in jigsaw-puzzle like fashion. ICLEI isn't a local movement any more than McDonalds is a local diner. However, when we see the golden arches in Lubbock, Texas, or Paris, France, we understand we're seeing corporate McDonalds, not our hometown diner. But, we have not yet trained our eye to recognize that when we see the same environmental-ish battles cropping up in Plumas County, Marin County, Bainbridge Island, or San Juan County, we are seeing the corporate environmental-ish agenda at work, not a local one. One of our local San Juan County citizens, Kay Kohler, has run into a spot of trouble on her family homestead that she inherited in Snohomish County ... and her situation has lessons for us in San Juan County because, incredibly, it is not an isolated case. In fact, Kay's situation is remarkably similar to the way Rachel Dietzman and our Prosecuting Attorney treated Lopezian Nicholas Padvorac during the Fisherman Bay Road Improvement Project. We will explain that situation in a later post, but the message we want to convey is that you should pay close attention to the way the County interacts with its citizens on Public Works projects ... because this could happen to you. It's part of a developing pattern involving critical areas (in this case, wetlands, but it could just as easily be shorelines or something else), Public Works, stormwater (think Eastsound mosquito hatchery), contractual fine-print, and the legal power of bureaucratic whim. The five acres that Kay Kohler owns in Snohomish County was bought by Kay's grandfather in 1936. Kay has old photos of the place dating back to that time, showing what it looked like then. When Snohomish County started developing rapidly, the Kohler clan did not sell the farm, which is located just north of Lynwood. They held onto it, and houses sprang up on all sides. In 2007, the County wanted to purchase a portion of Kay's property for a road improvement (stormwater) project, and in 2009, after three separate appraisals, Kay agreed to sell one acre of her property to the County for $404,000. At the time, it seemed like a pretty straightforward deal, and neither Kay nor her (now former) attorney noticed that the fine print of the contract said that the County could change the valuation of her property after the fact through "condemnation" or "some other" method. In November 2011 ... two years after the sale ... the County hired an "expert" to re-value Kay's land. The new expert valued the 2009 land transaction at just $48,750 because, the expert claimed, Kay's land was covered by wetlands and was hardly worth anything because it was un-developable. Snohomish County then condemned Kay's land for $48,750 and demanded that Kay hand back $355,250. Then, the County began court proceedings to get its money back. Notwithstanding that Kay has photos stretching back over 70 years showing her land as not being wetlands ... notwithstanding that the County, as development proceeded apace in the 80's and 90's, configured their stormwater system to dump millions of gallons of stormwater on Kay's property without her consent ... notwithstanding that Snohomish County has an NPDES permit that prohibits stormwater discharges that bypass their system ... all that notwithstanding, Kay's legal case was bungled and she lost both her court case and her appeal. Snohomish County is now threatening to freeze Kay's bank accounts in order to get back its $355,250. Ironically, after declaring Kay's stormwater-flooded property to be "waters of the United States" (i.e., a wetland), Snohomish County then failed to get the required permits from the Corps of Engineers (Section 404 Permit) and the Department of Ecology/EPA (Section 401 Permit) that are necessary for construction projects occurring in wetlands. Is it a wetland only when the County wants to get it for a cheap price, but not a wetland when the County wants to avoid getting the federal and state permits needed to build on it? And so it goes ... rules only work one way in Snohomish County ... just like they do in San Juan County ... (ethics too, and an upcoming post will examine the controversy currently being manufactured by David Dehlendorf and Kyle Loring about our Planning Commission). Note: ICLEI has recently changed its name to Local Governments for Sustainability even though it continues to use its original acronym of "ICLEI."